Microsoft Outlook stores user data in OST and PST files. An OST file is a cached copy of a user mailbox that is stored on MS Exchange server. A PST file is a personal folders file containing email messages, calendar, tasks, and other items of user and stored locally on the PC. Sometimes Outlook PST files can become corrupted and cannot be opened in MS Outlook. If a user cannot open the mail archive in pst files, it becomes a headache for Hepldesk and administrators . In this article we’ll talk about the main reasons why personal folders files get damaged and how to repair a damaged or corrupted Microsoft Outlook pst file using the Inbox repair tool. The reasons why the archive files of personal folders in Outlook get damaged can be different. This can be a result of errors in the file system (in this case you should start with the file system check), damage of the PST file structure due to accidental closure of Outlook (it happens quite often), power failure, virus activity, storing PST files in the shared network folder (this configuration is not supported by Microsoft), etc. Also you shouldn’t forget that the larger the file is, the more frequently the errors occur, so it is recommended to work with PST files no larger than 2-8 GB. If the similar errors occur, a PST file is damaged and its logical structure has to be repaired. However, if necessary a user can create/move a personal folders file to any location. Important! Before you repair a PST file, make a backup of this file. 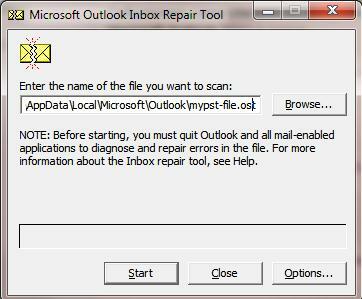 Thus you’ll prevent further damage of the file by a repair tool or Outlook itself. 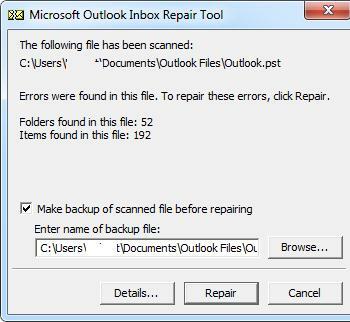 To recover the damaged Outlook archive folders, Microsoft supplies a special Microsoft Outlook Inbox Repair Tool (scanpst.exe).This small tool is not an all-in-one remedy and doesn’t allow to repair a PST file with any damages, it rather helps to solve the majority of typical issues that may occur to personal folders files. Let’s try to repair the damaged PST file automatically. 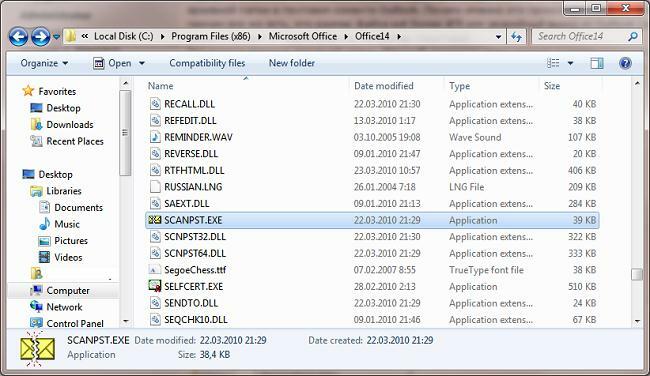 To do it, start scanpst.exe and specify the path to the PST file. Important! 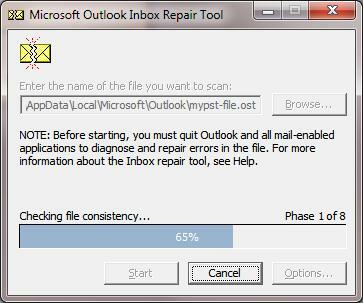 Before starting the tool, close Outlook and other processes using the PST file to be repaired. To scan a file for errors, click Start. Validation and analysis of the file structure consists of 8 steps. The scan time depends on the size of your PST file and the number of errors in it. In our case the tool has reported that the personal folders file contains some errors and suggests to repair it (the Repair button). If you haven’t made a backup of the PST file, you can do it now by checking the correspondent box and specifying the file name. After you click Repair, the PST file repair starts, which also consists of 8 steps. In our case, it has taken 15 minutes to repair a 1GB archive. If it goes ok, you’ll see the message Repair complete after the tool is done, and you can try to open the PST file in Outlook. So, as we have told already, scanpst.exe helps in most cases (about 90%) when errors in PST file occur. 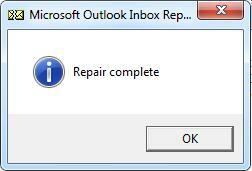 This Outlook PST repair tool successfully repaired the damaged .pst file and save it in their original format. I was amazed to see all email items in their original format with all components i.e. messages, attachments, media files, images, meeting requests etc.. It’s really worth it ! Last week, my Outlook mailbox was not getting opened. After reading this post, I used ScanPST.exe but it suddenly stopped before completing the entire phase of email repair. Then, I decided to go with the recommendation given by MVP, tried Stellar PST repair and the software successfully resolved the issue. David, here in my scenario: Scanpst is working fine but only for the low size pst file. Not sure if this is the limitation of this utility or something else but it couldn’t repair my pst file 🙁 Just browsing through the web for the solution…have you tried this software http://www.stellaroutlooktools.com/scan/pst-repair.php ?? Can you share your experience with the tool? It did expected work for me. Right now, i am using hassle free Outlook 2016 email application.